Well-behaved dogs are a pleasure to live with and they are welcome practically anywhere. With more than 40 years of experience training dogs for both companionship and obedience competition, our staff (based in Stockton / San Joaquin Valley, California), can teach you how to train your dog - or we can do it for you. We use positive reinforcement training techniques. We offer three training options: group classes, private one-on-one lessons, and our board & train program. Our group classes focus on basic obedience and establishing a proper human-canine relationship. To see when the next group class begins, view the 2019 class schedule. Classes are held in our state-of-the-art, climate-controlled training hall or outside, weather permitting. Tuition: $150.00 for all 8-weeks. 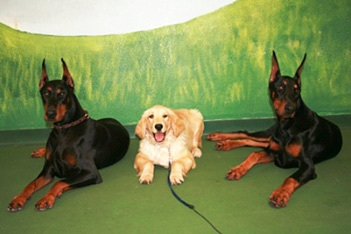 Group training obedience classes are open to dogs and puppies of any breed that are 16 weeks or older. Vaccines must be current for DHPP, Bordetella and Rabies. We accept positive titers reports. Please note: Bordetella vaccines must be administered at least 5 days prior to the first class. Dogs with social issues (reactive or aggressive behavior towards dogs and / or people) will need a private evaluation and training session before attending a group class. There is a $80.00 fee. Please call to arrange this before enrolling in group classes. Class size is limited, so that everyone gets plenty of personal attention. To secure your spot in the next available group class, enroll online now or call (209) 931-0758. Dogs that need advanced training, such as off-leash, out-of-sight stays and hand signal exercises (after completion of our basic obedience group classes). Puppies less than 16 weeks old that are too young for group classes. (Requires at least two DHPP vaccinations and one Bordetella vaccination at least one week prior to coming to the facility). $80.00 for a 1-hour lesson. Dates / times for private lessons can be arranged at the convenience of you and your trainer. Please call (209) 931-0758 or "Send Us A Message" using the form on the right hand side of this page. We offer two Boarding School options for your four-legged family member. A four-week foundational obedience training program where all training is done on leash. In addition, we offer an eight-week program for more advanced training which includes off-leash training. Fees include boarding, professional training and private transfer lessons for you, your household family members and your pet with the trainer before he / she is released into your care. The four-week session is $2,500.00 and the eight-week session is $5,000.00, all inclusive. Requires a 50% deposit at drop-off and the balance at pick-up. We accept VISA and MasterCard for your convenience. Throughout the program, you are welcome to visit your dog during regular business hours. However, visits must be pre-arranged, so they do not interfere with training sessions. For more information or to enroll your dog please call us at (209) 931-0758 or "Send Us A Message" using the form on the right hand side of this page.